Yesterday night I listened to an NPR story about the history of the song Strange Fruit, made famous by Billie Holiday, who used to sing it at the end of her shows. The song was written by a Jewish man named Abel Meeropol (he used the pseudonym Lewis Allen). 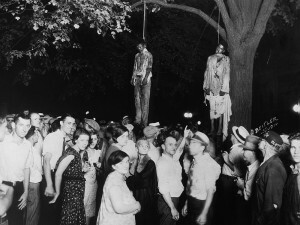 Meeropol was inspired to write the story after seeing a photo of a lynching that happened in Indiana 80 years ago on August 6th (the song references the South, but events the song describes took place in Yankee territory). Three young black men were arrested for possibly taking part in the shooting of a white man (a white woman was also at the scene). A mob broke into the town jail using sledgehammers after the sheriff wouldn’t let them in, took two of the young men, beat and hung them from a nearby tree. A third boy was brought to the tree, and a noose was put around his neck, but the tide of the mob turned, and he was eventually returned to the jail alive. Meeropol saw the famous photo of the lynching and wrote the song, which was published in a Marxist publication called The New Masses. Later, Meeropol and his wife adopted the sons of Julius and Ethel Rosenberg after the Rosenbergs were executed. Learn more about the song and the events that inspired it here. Watch Lady Day sing it below.